If I train for 139 more days and complete an essay, I will be allowed to test in December of 2009. Different to some schools, the testing staff at Honbu do not flex or fudge numbers in order to test a student who they believe “ready”. They check that all minimums have been met and then schedule tests for everyone who meets the minimum requirements. Given the number of students who train here, the judges often don’t have a sense of the students’ ability before seeing their technique. As a result, they tend to be strict and it is common to see people fail for technical reasons. Same as above (Topics will be assigned)”. “Same as above”, means all previous test requirements and an essay. The additional requirements beyond 2nd dan are sword and staff disarming and multiple attackers (unspecified number). Since I tend to be a bit on the wordy side, the essay requirement doesn’t bother me. The others will be challenging. You see, despite the world-class teaching staff and the resulting high quality students they attract, Honbu has neither sword nor staff training in their official curricula. Multiple attacker practice is also rare. So, what to do? Do it anyway! After class, before class, outside of class, these are the times and places to add the extra tools to the old Aikido bandoleer. After morning class, Mr. Kamitani has been grabbing me to practice sword disarming techniques. His 3rd dan test is in about 6 months and he is very worked up about swords. When Mr. Kamitani is absent or has found another victim (anyone who went to Iwama with the Russians seems to be fair game), I try to join Murai Senseu for jodori. If neither of them is available, Patrice still seems to enjoy very rough tanto tori practice. For multiple attackers, I haven’t come up with a plan yet but I think getting a list of willing folks together shouldn’t be too hard. After that we just need to commandeer a corner of the mat and go for it. Only 139 training days till Christmas, Woohoo! For the last few days I have been training with people who have, in one way or another, indicated they wanted me to teach them. I mentioned that to a part-time Honbu student who I was chatting with after class and that reminded him of something his teacher has been emphasizing lately. His teacher has been saying that when teaching people above shodan (初段), you need to make certain that you are teaching basics rather than teaching your own habits. Due to individual body differences, every Aikidoka will, to some extent, need to slightly adjust their technique to accommodate their own body but at that stage their goal should be to try to faithfully replicate their teachers’ art as closely as possible. The theory is that at shodan one’s focus should be on polishing the basics. Thinking back over the last couple of days it was clear to me that, when asked, the areas I have emphasized were my own habits. Here are some of the things that came up. Kotegaeshi: When coming out of the tenkan, I tend to throw an atemi at uke’s face. If they had any balance coming around, the punch takes that away (and leaves your hand in a good location to finish the throw). If they are already off balance, the strike makes them want to stay bent over backwards for a few moments longer than they might otherwise. Shihonage: I like to keep uke’s arm very extended and round (levered upward by my own elbow and forearm) from initiation to the end when they are heading for the floor. When done this way, uke is less likely to either disengage or regain their balance as nage passes under their arm. The extension should be out not up otherwise taller uke can use their height advantage to escape. This is as I was taught but I have met a lot of people who seem to think it is a bit extreme. Nikyo Omote: With a strong, heavy or resistant uke, I will connect uke’s wrist to my shoulder (no bowing wrist lock as with ura) and direct my body weight through uke’s arm to vigorously take their balance. This works pretty well for me. Nikyo Ura and Sankyo Pins: I squeeze uke’s shoulder firmly between my knees. During weapons work I pin with my knee across uke’s neck. Some elements are not strictly doctrinaire Aikido but, at this stage of my progress, they seem to work. What do you do that is not strictly as your instructors showed you? Should our goal be to NOT do these things? A delegation of Russian Aikidoka are visiting Tokyo this week. They hail from the Kenage Dojo in Moscow. As a part of their visit a special trip to Iwama was arranged. We met on track ten at Ueno station and boarded the one express train into the Ibaraki countryside. 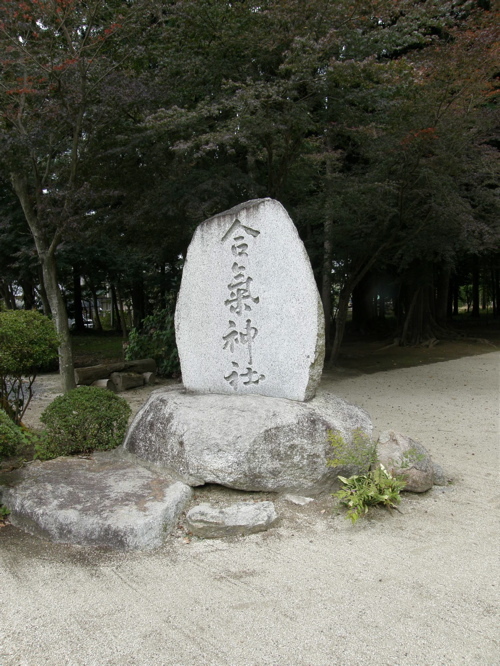 Both O-Sensei and Saito Sensei used to call Iwama home. Our group walked straight to the dojo from the train station. 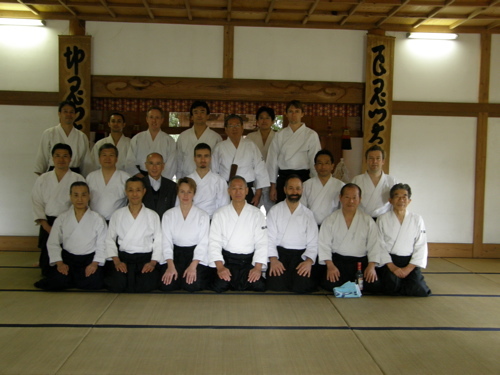 We were greeted by Inagaki Shihan and three uchi-deshi. The whole group quickly changed clothes and we went to the Aiki Shrine next door for a quick blessing. The Russians brought vodka and the group had brought sake and shochu (Japanese “vodka”) for the ceremony. On the way out, we bumped into a friendly looking group of folks from the neighboring Iwama Ryu dojo. It was nice to see them but it was a little disappointing to be reminded of yet another barrier within the Aikido world. On the positive side, I have seen organizational barriers in the US fall so have hope that friendly relations between these two Japanese organizations may eventually be restored. 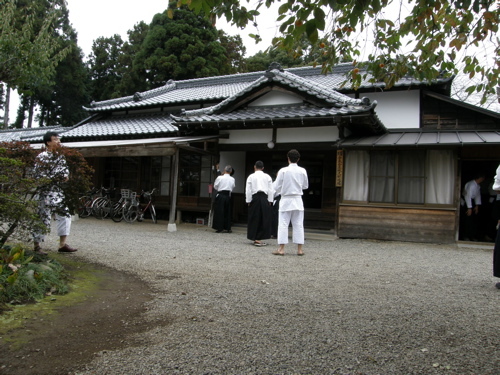 After the ceremony at the shrine, we returned to the dojo for keiko (稽古: training). The focus of the day was to be tachidori (太刀取り: sword disarming). However, Inagaki Shihan made it clear from the start that he felt that training in tachidori alone was a bad idea. He felt that there was a well defined order for weapons training and gave the following explanation. Without suburi (素振り:swinging practice) form could not be learned well enough to perform kumitachi (組太刀:paired sword training) properly. Without kumitachi a correct and sufficient understanding of awase (合わせ:blending) can not be achieved. Finally, without a proper familiarity with awase it is not possible to truly learn sword disarming. To start at the end yields form without depth. All that said, he agreed to show us the form, and what impressive form it was! 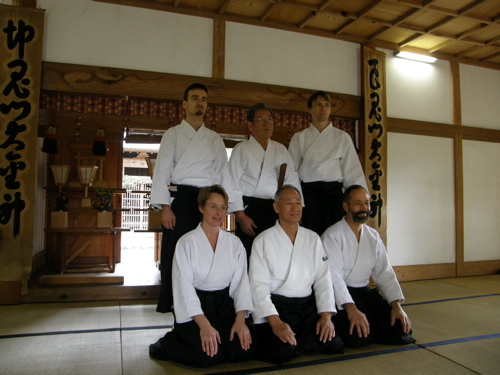 From the super clean irimi-tenkan and powerful atemi to awesome usage of kokyu ryoku, it is clear that there is incredible depth to the Aikido in Iwama. After practice we changed and went outside for a very friendly lunch. Two fires burned on either side of the long table and bento, beer, sake shochu and the now blessed vodka were set out for us to enjoy. The meal was good and there was much laughter and singing. 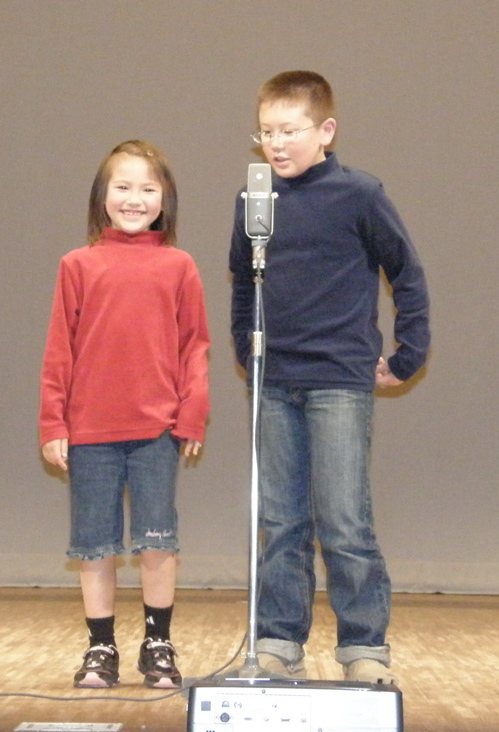 I was amazed that so many Russian folk songs had been translated into Japanese and that they were so well known. The Americans present (two uchi deshi and two visitors) mostly didn’t sing. There was a fellow from Tokushima who offered to teach everyone Awa Odori so I jumped in (I lived in Tokushima for seven years and danced almost every year) to dance like a fool, as is appropriate for the “fool’s dance”. It was a memorable day and even the trip back on the train was fun. Two cups of sake each loosened tongues and the stories and jokes got rougher as we got closer to Tokyo! I hope this group decides to go again! TECHNOTE : The irimi nage shown by Inagaki Shihan was based on the premise of an armed attacker and was performed the same way even when uke was unarmed. One way that this was expressed was (assume shomen uchi) that nage’s lead hand was used to “lead uke’s hand” at the start of the technique. In other words, it was presented as a target and then quickly taken out of the action. In fact, after sensei did his irimi deeply to the rear of uke, he kept the hand, that had been his lead, hidden behind his leg. He demonstrated that if uke had a sword and the hand was anywhere in front of his own leg then the hand could easily be cut. Taken from under the persimon tree in front of the Iwama dojo. 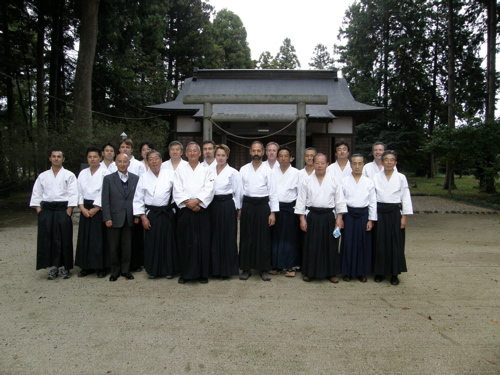 The whole group in front of the Aiki Shrine. Second Place! The kids took second place! Under Megumi’s tutelage, Ray and Kokoro have been preparing and practicing a skit for a Shinjuku area standup comedy contest. The local government, in cooperation with Yoshimoto Kogyo (an Osaka based comedy talent company) put on today’s “Food and the Environment ” themed stand-up competition. 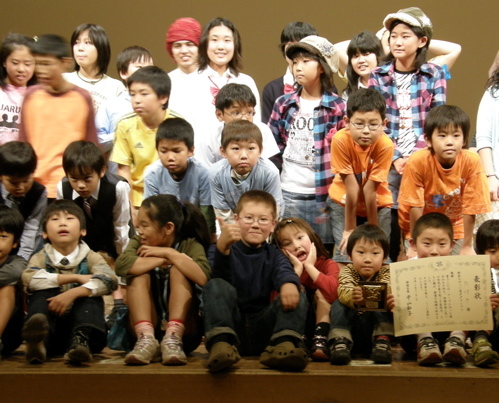 The comedy style was Manzai (漫才) — Japanese pun-laden, slapstick, buddy comedy. Ray played the tsukomi (突っ込み : straight man) and Kokoro the boke (呆け : funny “man”). Riffing on healthy food and the environment sounds to me like a comedian’s nightmare but Megumi helped the kids put together a bunch of topical, eco-aware jokes that were, at least to this biased papa, pretty funny. None translate well but the conflict of food cultures that make up our home made for a few giggles. The idea that we regularly combine Japanese and American foods in such forms as Pizza Shabu-Shabu* and nato** milkshakes got a few laughs. The kids in the audience liked a fart joke about hybrid cars the best… it worked for Shakespeare too***, apparently, so who am I to judge? To start with, there were 49 teams split into four groups. Ray and Kokoro were the fourth pair in the first group so they got their performance out of the way early. From the original 49, a panel of judges picked 11 teams to go on to a final competition. We had time to eat lunch and participate in a couple of the other eco-events that were going on in the building before going to check out who had been selected for the finals. Several people came up and told us that the kids had been selected before we were even done with lunch so there was no real surprise when we went down and confirmed that they were on the list. The teams that were selected went on to present their material in front of a larger audience. 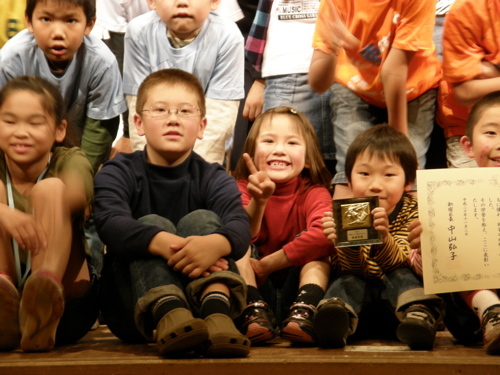 So with TV cameras and paparazzi filming away, the kids went on stage for an un-anticipated encore performance. 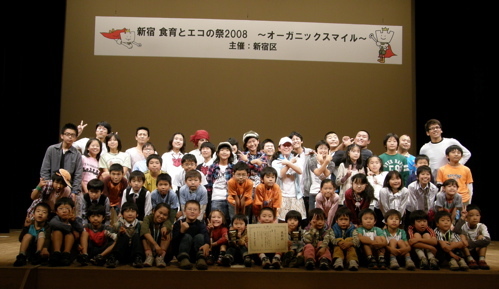 When all 11 were done, several teams of professionals from the Yoshimoto comedy factory worked the crowd until the judges made their decision. Before the results were announced one of the comedians stuck a mic in Ray’s face and asked him how he thought he would do. With confidence and poise that I find mind boggling, he calmly said he expected to win. Kokoro wasn’t as sanguine, she predicted that they would be last. In the end, the kids came home with second prize. We went to McDonalds to celebrate showing that we had learned absolutely nothing from the events of the day. * Shabu-shabu is sort of veggie soup fondu into which thinly sliced strips of meat is splashed about. ** Nato is fermented soybeans that are slimier than chopped okra. The taste and smell a bit cheesy. Roughly half of the Jpaanese population loves the stuff whereas the rest hate it — no-one is neutral about nato. *** Fart jokes not hybrid car jokes.